For holidays or everyday this hearty, lump-free gravy is a hit. Made with natural spices and no artificial flavors. Serve over mashed potatoes, turkey, stuffing, meatloaf and more. 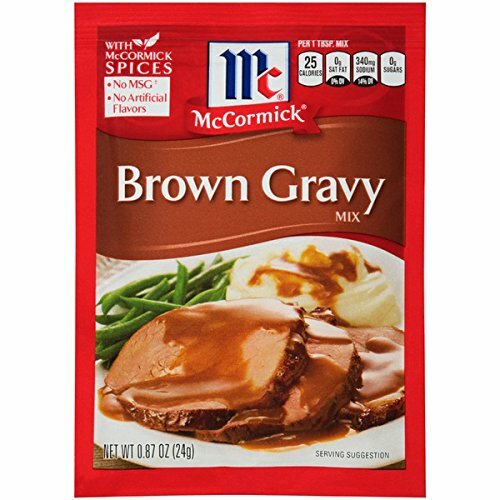 McCormick Brown Gravy gives your family an indulgent treat you can feel good about. Made with natural spices, this blend doesn't contain MSG or artificial flavors or colors, so you serve it for the holidays or any day knowing you're giving your family the very best. 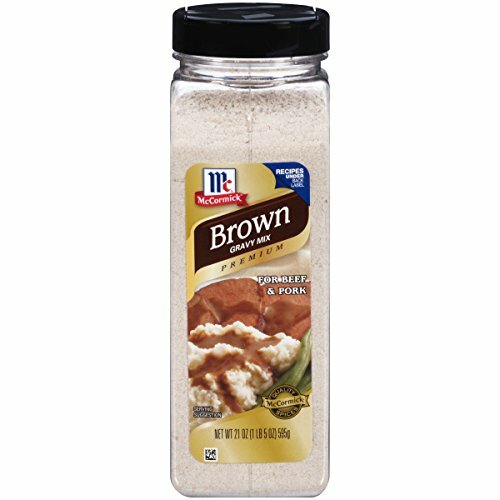 Use it on side dishes like mashed potatoes or gravy to enhance the main course by drizzling it over turkey or meatloaf. 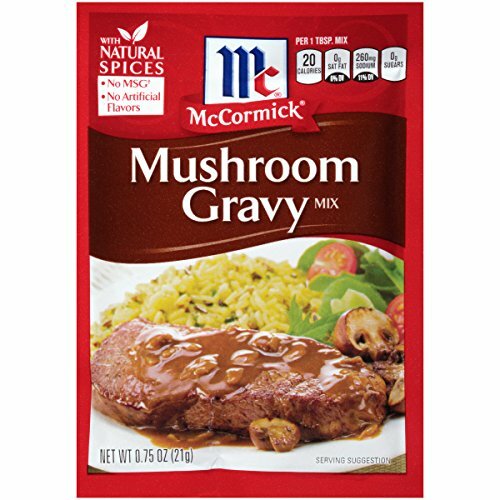 McCormick Mushroom Gravy provides your family with a savory, lump-free treat you can feel good about. Made with natural spices, this blend doesn't contain MSG or artificial flavors or colors, so you can serve over roasts, potatoes, stuffing and more knowing you're serving your family the very best. Add a tablespoon of red wine for a deliciously mature twist. Ingredients: Enriched wheat flour (flour, niacin, iron, thiamine mononitrate, riboflavin, folic acid), wheat starch, salt, beef fat, hydrolyzed soy, wheat, and corn protein, onion, caramel color, corn syrup solids, sodium caseinate (milk), spices (including white pepper), garlic, natural flavor, disodium inosinate and guanylate (flavor enhancers), extractives of paprika, and yeast extract. 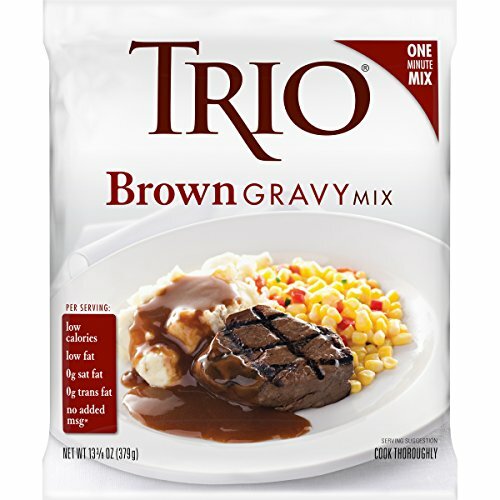 The hearty, roasted beef flavor of the TRIO Brown Gravy adds a distinct richness to a variety of dishes. Smother over an open faced roast beef sandwich or braised beef tips and egg noodles. Create your own gravies by using sour cream for a stroganoff, an ale or porter for a pub gravy, or cranberry preserves and lemon juice for something more seasonal. Quality sauces and gravies don’t have to take long. At least not with TRIO. In moments, you have several options on hand to serve, broaden your current offerings, or customize. The quality is trustworthy. The flavor is dependable. And the performance is consistent. Every time, in no time. Open. Pour. Stir. Done. 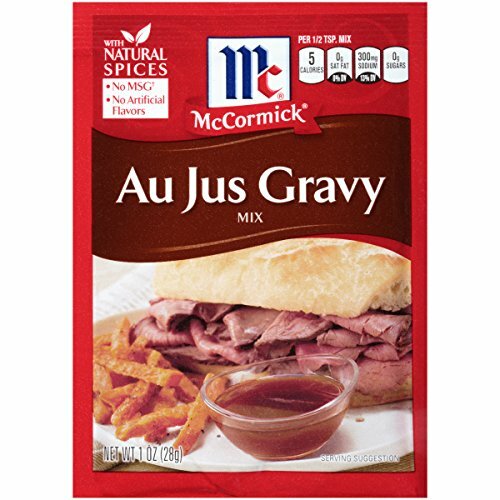 This McCormick Gravy Value Bundle includes a 21 ounce bottle of McCormick Brown Gravy Mix, and a 18 ounce bottle of McCormick Poultry Gravy Mix. No matter what the occasion, every meal can be made better with the help of McCormick Gravy, and with this Value Bundle you will have 2 flavors to choose from. 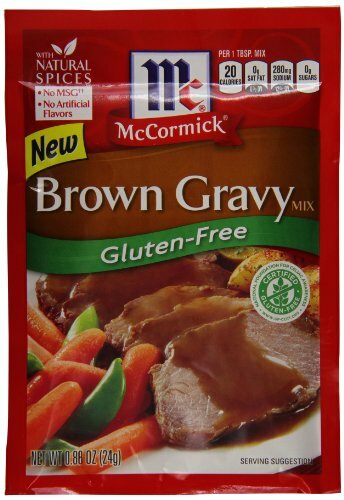 McCormickGluten-Free Brown Gravy gives your family an indulgent treat you can feel good about. Made with natural spices, this gluten-free blend doesn't contain MSG or artificial flavors or colors, so you can pour it over mom's famous meatloaf or mashed potatoes knowing you're serving your family the very best. How to make brown gravy fully explained. 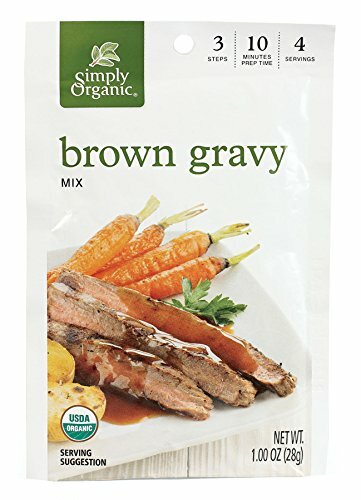 Compare prices on Brown Gravy at ShopPlanetUp.com – use promo codes and coupons for best offers and deals. We work hard to get you amazing deals and collect all available offers online and represent it in one place for the customers. Now our visitors can leverage benefits of big brands and heavy discounts available for that day and for famous brands.